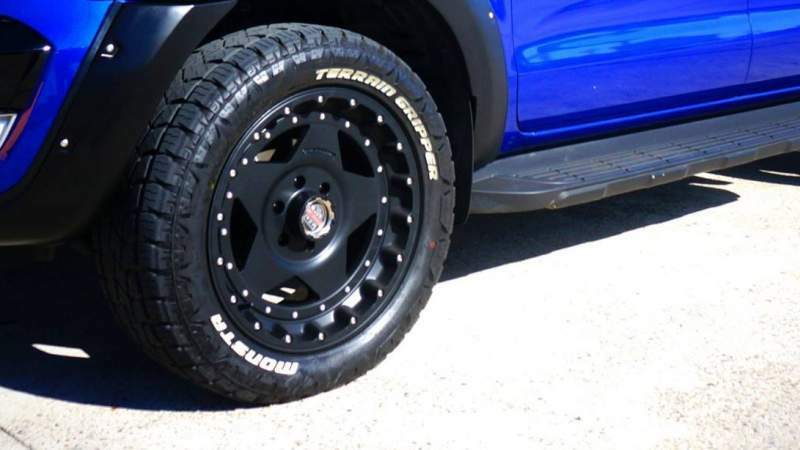 Installing lowering springs onto the front and blocks on the rear suspension of the Ford Ranger fitted with 18-inch wheels is the most effective and economical way to decrease the ride height of your Ranger two-wheel drive pickup truck. Installing the suspension kit takes a little less than an afternoon to accomplish, and requires little more than ordinary hand tools to complete. Larger wheels such as 18-inch rims have no effect on the lowering of the truck when utilizing springs and blocks. Jack up the truck and support the frame using jack stands. Be certain that the truck cannot rock or sway during the installation of the suspension kit. Use the lug wrench to remove the wheels and tires from the truck, then set them out of the way. Position the jack under the rear axle of the truck, and then remove the shackles which secure the axle to the leaf spring using the socket set. The shackles are attached to a mounting plate under the leaf spring with four nuts. The top of the shackle is secured over the top of the axle shaft. Discard the old shackles. The suspension block kit includes replacement shackles and nuts. Raise the axle of the truck a few inches with the jack until you can slip one of the suspension blocks between the axle and the leaf spring. Align the mounting pin on the suspension block with the mounting hole on the axle, and align the mounting pin of the leaf spring with the mounting hole on the suspension block. Lower the axle slightly, and then place the new shackles over the top of the axle shaft, down past the suspension block, then through the mounting plate at the bottom of the leaf spring. Install the bolts onto the threaded ends of the shackles which protrude through the bottom of the mounting plate and tighten them down securely. Perform the same operation on the other side of the truck before continuing to the front suspension.